Watch Me on”Ellen” and Other TV Shows | Keep It Up, David! I’ve had the pleasure of being on TV a bunch of times. Here’s the archive of videos! I’ve also been a guest on the Hallmark Channel talk show “Home & Family”! 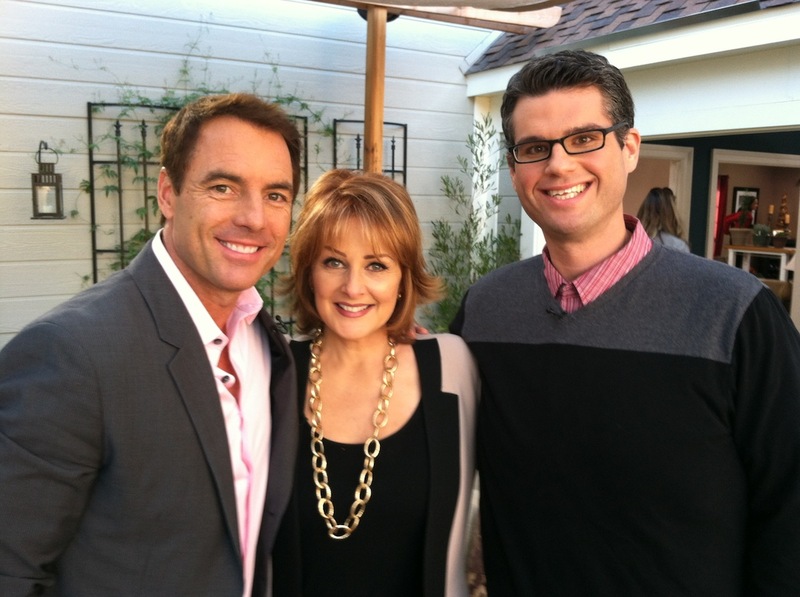 To watch my two-segment interview with hosts Mark Steines and Cristina Ferrare (pictured with me below), click here. To check out behind-the-scenes photographs from when I taped the interview, click here. In addition to appearing on “The Ellen DeGeneres Show” and “Home & Family,” I’ve had the pleasure of appearing on a number of other television shows as well. “The Jeff Probst Show.” In November 2012, I was a guest on Jeff Probst’s daytime talk show. I was the final guest in an hour devoted to weight loss. Watch the segment here. “The Doctors.” In January 2013, I appeared during a segment they did with Richard Simmons as a weight loss success story. I got to carry out onstage a giant foam blob that represented all the weight that I’d lost. You can see the clip right here, and see a couple backstage pictures here. This wasn’t my first appearance on “The Doctors” – in early 2012 I appear, very quickly, in a tape piece that was shot at Slimmons. I have one line. Watch it here. Richard Simmons Infomercial for “Project H.O.P.E.” In December 2012, I was photographed and interviewed as a Richard Simmons “long-term success story.” I’m featured in an infomercial! Watch it here, and get a behind-the-scenes look here. Richard Simmons Music Video for “Hairdo.” I’m a music video back-up dancer! Watch the video here (I’m in the back, a foot taller than everyone around me, over Richard’s right shoulder), and then read about how the video was shot. “Giada at Home.” I was invited to be in the background on Giada de Laurentiis’s Food Network show, eating the cocktail party food she made during that episode. It was a ton of fun, and I got a little screen time. Learn how to watch here and see a pic of me and Giada here. Hidden Camera Prank – “The Ellen DeGeneres Show.” In May 2011, I was a victim in a hidden camera prank for Ellen’s Cinco De Mayo segment “Sneako De Scare-O.” Click here to learn more and watch, although if ambush mariachi performances aren’t your thing, then stay away! KirstyTV. I was a guest on this YouTube talk show with Australian TV host Kirsty Spraggon. The interview is long – about 50 minutes – and you can watch it here. My Television Debut – “The Jenny Jones Show”! I was an audience member at a taping of Jenny in 1999, and I stood up, made a sassy comment, and ended up on TV. They put me in the promos and everything! Watch the video, and read the full story here. Game Show #1: “Pyramid.” I’ve always loved game shows, so when I moved to Los Angeles, I started auditioning for them. I taped this appearance on “Pyramid,” hosted by Donny Osmond, in the fall of 2002 and it aired in spring 2003. Game Show #2: “Merv Griffin’s Crosswords.” This game show wasn’t on the air for long, but I was a contestant in an episode that aired in the spring of 2008. Get the Behind-The-Scenes Story Here. There’s one more significant appearance that isn’t available online (I don’t think). In 2005, when I was working on “The Ellen DeGeneres Show” (years before I was a guest), I appeared in “Ellen: The Musical,” which was an all-musical episode of that show. There were about 7 songs throughout the hour, and I was in the ensemble for two of them: “First TV Taping,” and the grand finale reprise of “Breathe From Your Hoo-hoo.” If I’m able to get that online, I’ll be sure to share it! “Tia & Tamera“: I’m working out in the background. “Your World with Neil Cavuto“: Richard taped a greeting for him, and I’m in the background. “The Today Show“: I’m in one shot, for a matter of seconds. “American Ninja Warrior“: I sat in the audience to cheer on a friend, and while he didn’t make it on the broadcast, there’s a quickie shot of me! “Extra“: I’m in the background, behind Mario Lopez. I might have ended up in the background on “Kendra on Top,” too, because I was working out at my gym when her reality TV show crew was filming her working out, but I never saw the episode. Whew – that’s a lot of TV!